FRANKFURT -- Dealerships in Germany are unable to sell 300,000 used cars equipped with Euro 5 diesel engines because of fears that high NOx emissions may lead to older diesels being banned from cities such as Stuttgart and Munich. "These vehicles can only be sold with great difficulty at the moment because customers are uncertain," said Thomas Peckruhn, head of the ZDK association of German dealerships in a statement on Thursday. Based on an estimated price of 15,000 euros per vehicle, the organization estimates the overall fleet of unwanted diesels represents 4.5 billion euros of merchandise. ZDK said it surveyed of 718 franchise retailers across all brands on Aug. 22. It said the survey was the first it has directly conducted among dealers, and as such there were no comparison figures. Three-quarters of dealers responding to the survey said they have had to write down the value of some of their inventory. Nearly 85 percent claimed automakers were not providing enough assistance to help reduce the stock. As a result of slow sales, 77 percent of dealers said they had cut prices, the dealer association said. "We need clear signals from government if and under what conditions these vehicles might be affected by driving bans," Peckruhn said. German lawmakers' back and forth over potential bans for diesel cars in cities is sapping demand for the vehicles, which were on sale as new cars as recently as September 2015, and causing the backlog on dealer lots. Car bosses and government officials reached a compromise deal earlier this month to lower pollution. They agreed on software updates instead of more costly hardware fixes that are sought by environmental groups. Volkswagen Group, Daimler and BMW agreed to upgrade 5 million newer diesel cars and offer trade-in incentives on older models but the deal hasn't removed concerns about pollution from the technology. Citing government tests, German Environment Minister Barbara Hendricks told reporters on Wednesday that the planned software upgrades are "insufficient" for many cities to meet the legal limit for smog-inducing nitrogen oxides in the air. Reflecting the pressure on demand, some 29 percent of diesel drivers in Germany said they would try and sell their cars as soon as possible because of concerns about falling values as cities mull driving bans, according to a survey by Deutsche Automobil Treuhand (DAT) market-research firm. Pressure on used car prices, particularly such relatively young vehicles, is expected to further intensify as a result of the automakers' trade-in bonuses for outdated diesel vehicles, the DAT said. 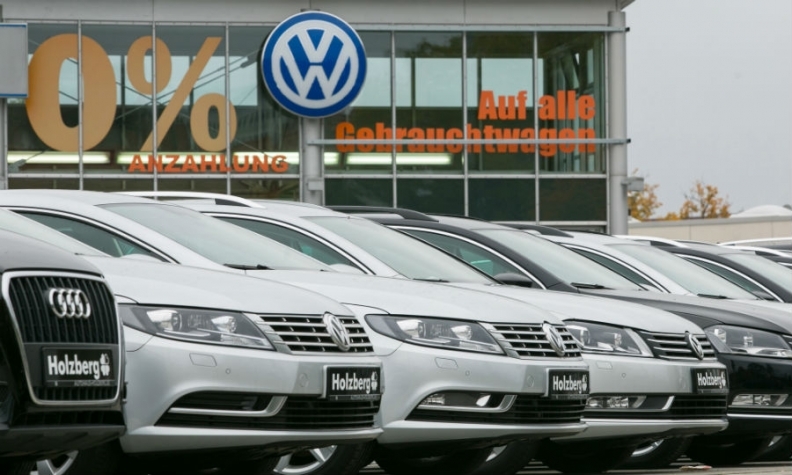 Volkswagen is offering as much as 10,000 euros on cars with Euro-1 to -4 emissions standards. The bonus is paid only when customers exchange their old diesels for new cars, making "young" used ones less attractive. As many as 20 percent of drivers, or 1.3 million car owners, could take up the manufacturers' offers, according to consulting firm Oliver Wyman. The value of used diesel cars is an important factor in the calculations for carmakers' sizable fleet sales, and plunging prices could trigger writedowns in their lease portfolios. In Daimler's case, half of its car sales are either financed or leased by its financial services unit. There are about 6 million diesel cars with the older Euro 5 emissions standard registered in Germany currently, according to the country's Federal Transport Authority. "The new 'diesel fear' among customers has significant consequences for car companies," Cedric Perlewitz, an analyst at Commerzbank, said in a report Thursday. "Carmakers need to significantly expedite their strategic shift to electric cars."